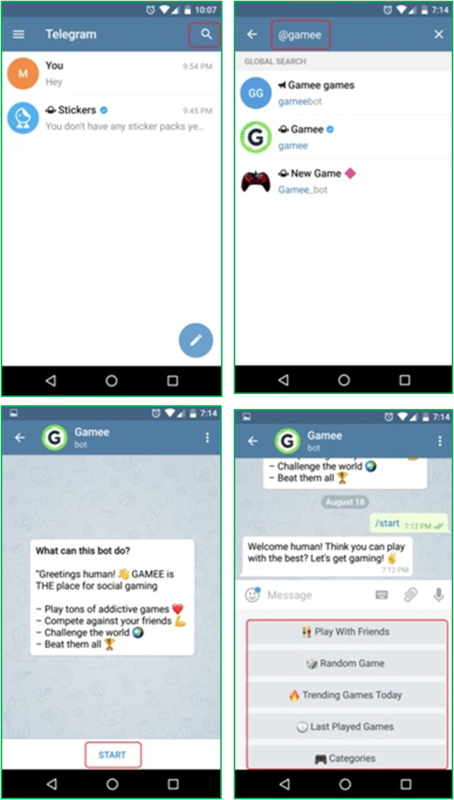 Home Technology Mob Apps 10+ Cool Telegram Messenger Secret Chat Tricks To Become a PRO! 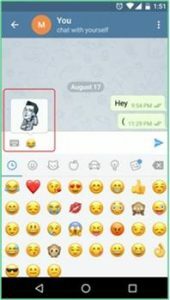 10+ Cool Telegram Messenger Secret Chat Tricks To Become a PRO! 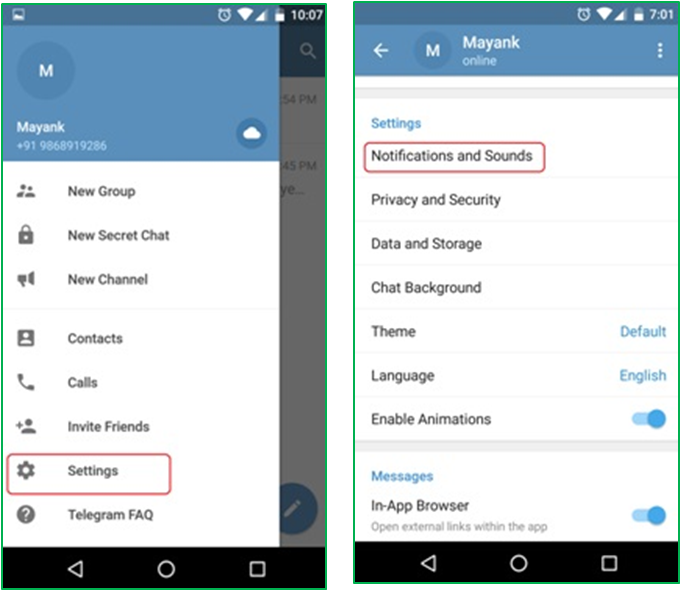 Besides, being absolutely free, cloud-based and powered with end-to-end encryption of messages, Telegram has a gamut of unique features that set it aside from others such as Whatsapp, KakaoTalk, Viber, Line etc. But, here’s the catch — if you are a new user who finally managed to download the app, it will be quite hard to get around Telegram unless you know certain cool hacks. Yeah you can login and fiddle around, but you won’t really harness its true potential unless you check these secret chat features. Even old-time users might not be familiar with some of these tricks. Fret not, they are very easy and will certainly make using Telegram Messenger a walk in the park. 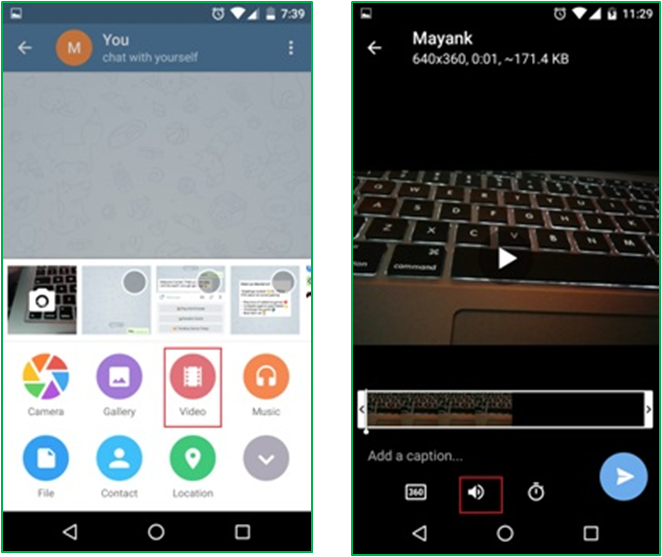 So, without further ado, here are 10 amazing tricks for avid Telegram Messenger users! Telegram has taken creating GIFs on mobile to another level. You can now add an element of fun to your texting experience by adding slick GIFs on the go! The best part is you won’t have to download a dubious third-party app. So, how do you do it? To start with, Tap on the attach button in chat > Hit video to record a video in the Telegram App > Trim the duration if you want and press the mute button in the bottom pane > Revel in amazement as your video will loop into an auto-played GIF! Effortless and simple. What’s more? These videos will be automatically saved to your GIFs section for future usage. 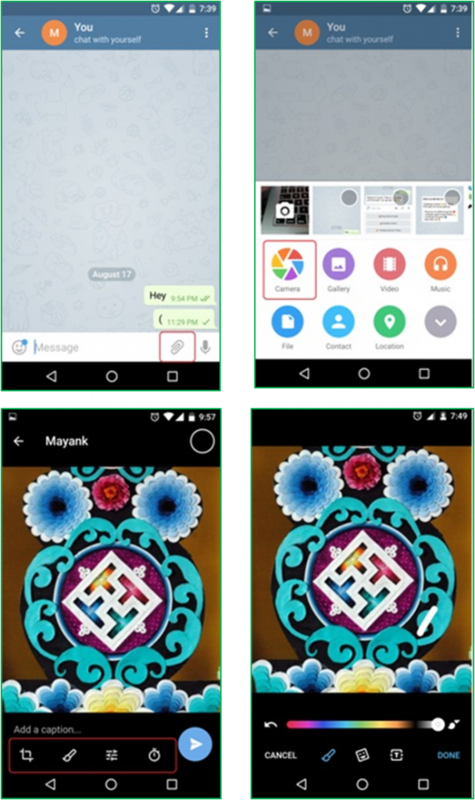 Do away with any storage-grabbing image editor apps on your phone right away. Why? Because, Telegram offers an in-built photo editor that will be good enough for you to share some amazing, quality pictures with your friends and family. Click on the Attach File button in your chat > Select the camera button to take a new snap or click on gallery to select from previous photos > Once you have the photo taken/selected, you will be directed to the photo editor where you can: crop, adjust contrast/brightness of the photo, and add colour filters, etc. There’s more – you can even add a self-destruct timer to the photo which will come into play as soon as the photo reaches the receiver à la Snapchat. Thanks to the open source nature of Telegram Messenger, users can now play some swanky in-app mobile games in HTML format created by independent developers. And, yes these lush games don’t cost a dime! To play a game: Search for any Game Bot by adding “@” as prefix > Select the bot and hit the Start button > Navigate through various games and select the game of your choice! Once again, you can instantly kill boredom with these ready-to-consume games and save some much-needed space on your smartphone by getting rid of unnecessary third-party two-bit games. Someone rightly said emojis are passé and need an overhaul. 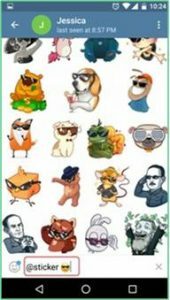 Telegram has taken this statement a notch further by integrating emojis with stickers. Now, as soon as you type in an emoji, a related sticker will pop up on the screen to make texting an immersive experience. You can even scroll down and choose from numerous stickers related to a particular emoji (the numbers depend). 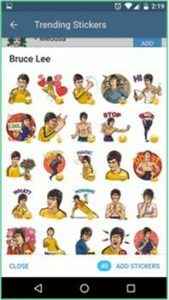 Moreover, if you want personalised stickers, you will have to use the @stickers bot to make your conversations much more livelier. 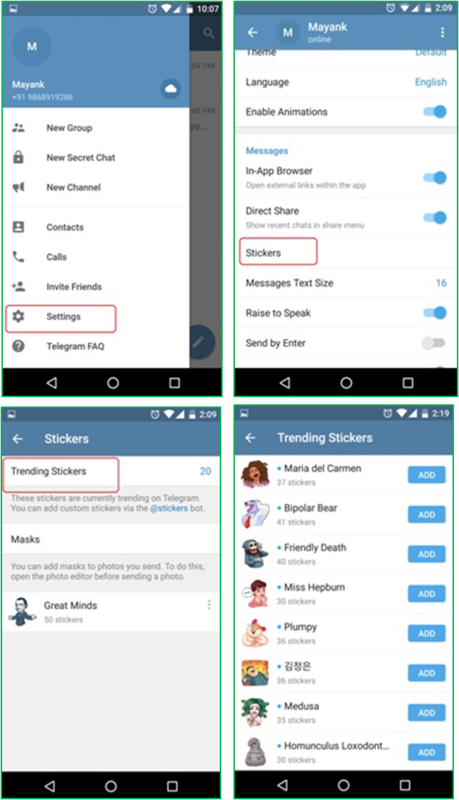 Go to Settings > Tap on Stickers > There is a pack of pre-installed stickers and Trending Stickers > Tap on Trending Stickers > Add any sticker pack from the list to have a gala time chatting with your friends. Note: One downside is that not all emojis are backed by related stickers, but hopefully this will be resolved soon. 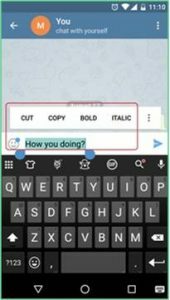 Another area where Telegram trumps its rivals is in the “ease of use” department where it provides additional font styling. If you are feeling bogged down by using symbols and special characters just to decorate a text with Bold and Italics, cheer up! 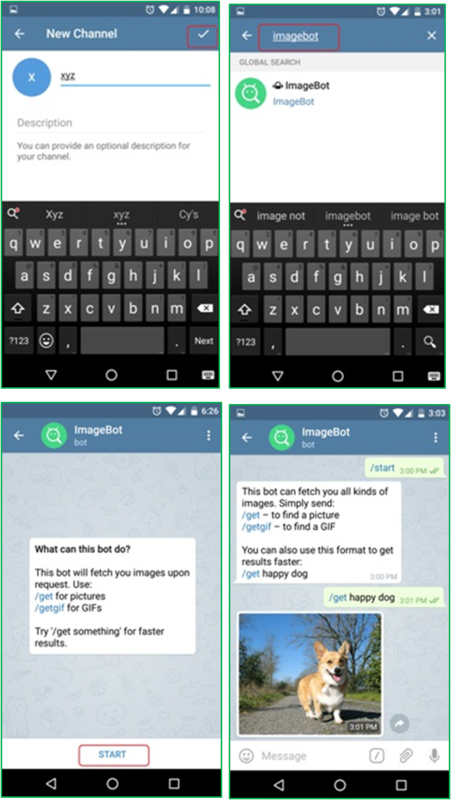 Telegram comes loaded with an inbuilt keyboard that can italicise and bolden your text in a jiffy. Select a sentence or word and hover over the strip of options > Now, simply select the desired font decoration feature and you’ve nailed it! Messaging apps can be terrible phone storage hogs. For instance, Whatsapp is notorious for shrinking a phone’s storage space in no time. Even though Telegram uses minimal space and backs all your data efficiently in its cloud storage server(s), you can still clear local cache to de-clutter your phone. How? Go to Settings > Select Data and Storage > Under Disk and network usage head, select Storage Usage > Tap on Clear Cache > Select the Cache you want to get rid of, hit Clear Cache again. Bots set Telegram apart from rest in the messaging app universe. 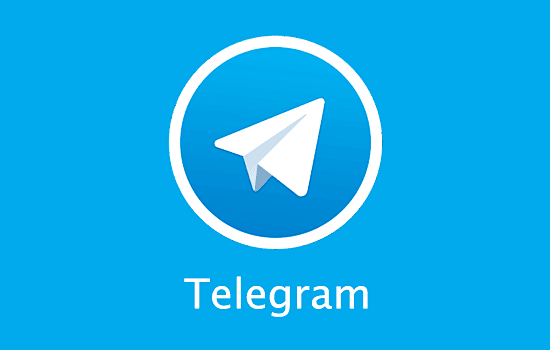 Simply put, they are telegram accounts that add another dimension to the user experience. For instance, with these intuitive bots, users can perform varied functions such as playing games, broadcasting, fetching information, et al. How does one make them work, you ask? 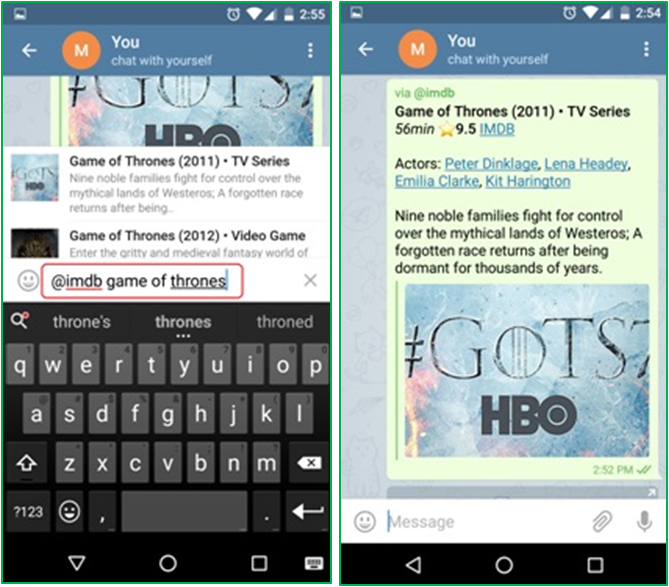 Tap on new message > Type in the name of any bot by adding “@” as a prefix > For instance type in “@imdb” game of thrones to get smorgasbord of information on Game of thrones. Alternately if you don’t want to add the prefix, go to Search > Type in the name of the bot > Tap on the result > Hit start to avail its services. One major takeaway is that these bots can function like google search inside the app itself! Want to send a message to a close friend/relative of yours while they are grinding away at work or sweating it out at the gym? There’s a nifty solution for you! 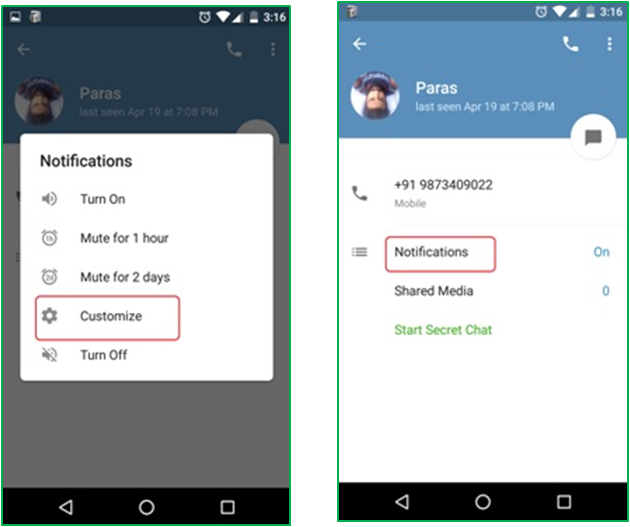 Well, Telegram Messenger allows users to send muted messages without letting the recipient receive any notification(s). Tap on the menu icon in the top left corner of your phone’s screen > Select New Channel > Name your channel and tap on the tick > Choose either one of Public or Private Channel > Add a recipient, type your message and tap on the notification bell button, then hit send and voila! Note: tap on private channel for individual users. You will figure out this feature will come in handy in many situations. 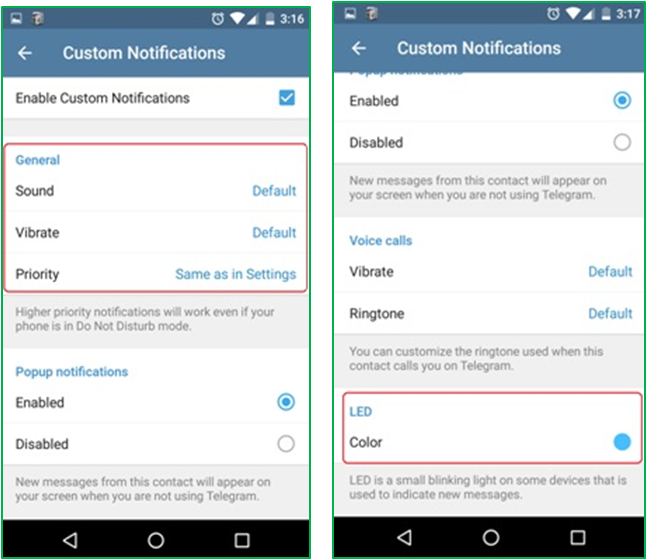 If you want to distinguish between your close friends and acquaintances, Telegram Messenger allows you to assign distinct LED colour tags as well as notification sounds to individual users. The same phenomenon holds true for groups. So, the next time you see an LED notification light or hear a personalised preset sound you would know it is from someone close! 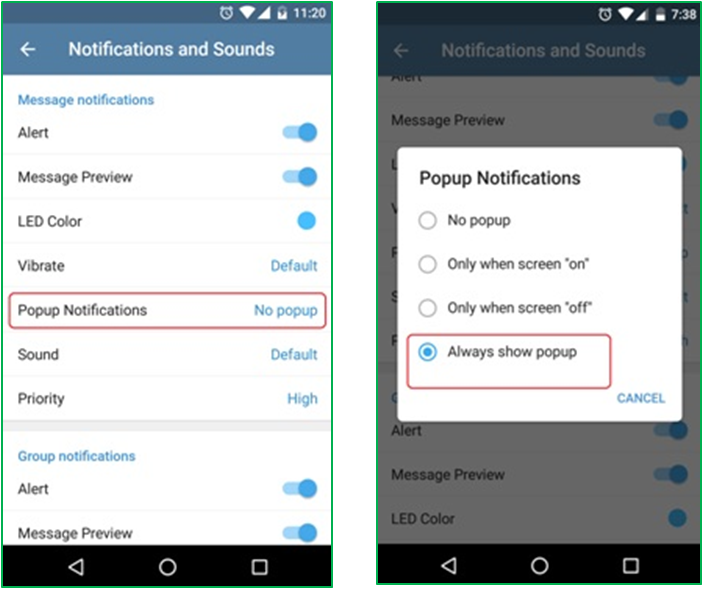 Go to the individual’s profile > Enter Notifications > In the message notification tray, tap on Customize > Under the General tab you can change the notification bell tone > Scroll down further and under the LED heading tab select any one colour of your choice. Just as a heads up, you can follow a similar mechanism for diverse groups, too. We all know getting pop-up notifications every now and then can be very irksome. Mainly because we have to tap on them and then do an app login to reply to a message, etc. But, with Telegram Messenger it will be a good riddance. Now, you can directly reply from the home screen via the notification bar without going through the hassle of opening the app. Simply go to Settings through the menu button > Tap on Notifications and sounds > Select Popup Notifications. Choose between 4 options based on your desired preference. Of course the most favourable is Always show popup. To sum it up, without a doubt Telegram Messenger is one of the best apps for instant messaging out there that is currently giving its rivals (read: Whatsapp) a jolly good run for the money. You can download and try it now to see the difference yourself. At first glance, it might seem a bit sophisticated, but with the aforementioned tricks up your sleeve, you can surely vouch for being a pro at using Telegram Messenger amongst your friends.